VIBIMA is a family company with a long tradition of craftsmanship. We began by making artistic glass (leaded glass) and later went on to explore and develop new techniques, bringing our interests and dreams to life, along a path that has led us to produce heat-fused glass. Through the years, we have worked with diverse glass-making techniques, often combining them all, making better use of energy and directly recycling whenever possible. Because our raw material is heated glass, our pieces are always handcrafted. We are constantly exploring the field, to obtain sensational, unique, high-quality products, without losing sight of the importance of recycling, which is also a high priority for us. 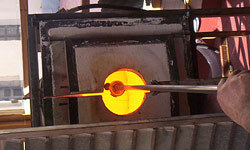 The art of glass making dates back to the Bronze Age. Though developed by the Egyptian and Greek civilisations, each region used different proportions of raw materials for its manufacture. Generally speaking, there are three main groups of materials used in glass making: vitrifying agents, flux and stabilisers. Our technique, FUSING, flourished in ancient times and went on to disappear for some 2000 years with the emergence of another technique, blown glass. The fusing technique finally reappeared in the late 19th century, becoming a means of contemporary expression throughout the world. Fused glass pieces are of vast beauty, and their utility can be applied to the fields of art, decoration, architecture, Jewellery and lighting, among many others. Glass making is a new means of expression that is constantly transcending all known limits, for total innovation. Indeed, the discovery of glass has led to the adventure of painting with light, replacing the paintbrush with light itself.